Louisa Waterford (1818-91), modest, retiring, of good family, renowned for her beauty, and with extraordinary grace, was the embodiment of a Victorian ideal of womanhood. But like the age itself, her life was filled with contrasts and paradoxes. She had been born with artistic gifts, and became a satellite of the Pre-Raphaelite Brotherhood, though she had no formal training. Then, at the height of John Ruskin's intellectual power and success as a critic, she asked him to accept her as an art student, and he accepted. Their correspondence- often harshly critical, never, as Waterford put it, falsely praising - lies at the heart of this book. These are letters which open a spectrum of discussion on the cultural, gender and social issues of the period. 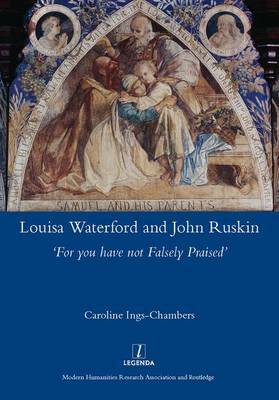 Both Waterford and Ruskin engaged in tireless philanthropic work for diverse causes, crossing social boundaries with subtle determination, and both responded to a sense of duty as well as an artistic vocation. But, as Ings-Chambers shows, their correspondence was more than a dialogue about society: it helped to make Waterford the artist she became.